A powerful visual representation on the web is essential whenever it comes to modeling. You need to look fantastic both live and online. Standing out from hundreds of other models is not as easy as it may seem. Modern website building platforms make it easier to represent a model with some stunning and professional photos in addition to fundamental features lie simple editing and creating a bright portfolio website from scratch without technical skills within less than a day. Stay social and speak volumes through major social platforms. Jump to: 10 Tips To Success Modeling Portfolio. After reviewing and testing dozens of different website builders, we have sorted out two ultimate platforms for building a catchy modeling portfolio in less than a day. They are Wix and uKit. Let’s have a closer look at their main features and advantages. Social Media Buttons – staying social is vital for models. Wix provides built-in social media widgets. Or you can replace it with another one from the App Store. When it comes to pricing, Wix has some great offers for those who do not require complicated websites with numerous sections and tons of content. The platform has a free plan, which may look like a good option. However, pay attention that it does not include a free domain name and hosting. Moreover, a free plan offers only 500 MB of storage, which may be not enough. At the same time, Combo Plan will cost you only $7/month. The price already includes SSL encryption to protect your data as well as a free domain name, hosting and 3 GB of storage for all your photos and media files. Read also: A Complete Wix Review. Advanced Design Mode – customize your website in accordance with your style and preferences. Choose the background and main theme color, upload images and use uKit color pallet to create a stunning look for your portfolio. Unlike Wix , uKit does not have a free plan. However, you can test the platform in a free trial mode to check if it suits you fine and meets your expectations. 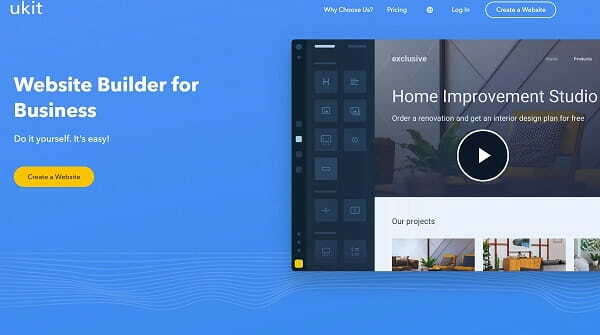 As for the pricing, this website builder is probably the most affordable one considering $4/month for a Premium plan with free templates as well as no ads and hosting already included in the price. Read also: A Complete uKit Review. A couple of coffee cups, two evenings, a right choice of effective shots – and you are ready to send a link to you own portfolio website to the potential employers. What are the nuances to be considered, if you intend to reach decent result? We have compiled a list of 10 recommendations, which can become your success tips. 1. Choose a Template That Meets Your Photo Style! Yes, your portfolio website should focus exclusively on photos. Even before you start working, choose the best photos from different categories – snapshots, tests, commercial projects. After a thorough image sorting, proceed to selecting a website template. This will help you choose the best design, which can highlight the advantages of your images. 2. Moderate Eccentricity Is Your Best Tool! You don’t have to stick to certain portfolio design rules. You can add a contrasting and even controversial image to the home page just to attract the attention and encourage visitors to find out more about your personality. By the way, it is not obligatory to use a photo only. You can use a video, GIF or cinemagraphs along with standard photos, where it is appropriate. 3. Reveal A Broad Spectrum of Images to Surprise Everyone! The potential employers want to see beauty and flexibility in models. It’s crucial to provide them with the required amount of material to form the ideas as to where your potential can be used to the advantage. Showcase yourself in different attires, sceneries and emotional appeals. Choose 10-15 photos of diverse storylines, divide them into separate categories for distinct perception. 4. If You Feel Confident, You Can Take a Risk! Traditionally, only the best photos are included into a portfolio. You can use several less successful photos amid the general image gallery. This can also be a storyline, in which the image will differ from your general look. This is done to make contrast with your best shots. The visitors will notice the difference and, maybe, will like your best photos, which form the basis of your portfolio. 5. Organize the Photo Order Attentively and Develop a Winning Strategy! Mind that a portfolio is not a photo album for your Instagram friends. There is no sense in adding images to it, which don’t matter a lot for the potential employers. For example, there should be photos without make-up and hair do as well as those in a swimming suite or with a detailed view of your face, arms, neck etc. depending upon the modeling business niche you target. The first 3 photos should be very successful, the medium may be mediocre, while the last photos in each category should be also the best. 6. Choose High Quality Photos Only – Mediocre Images Won’t Work! It goes without saying that nobody will have a desire to look at vague pixel photos. It is preferable that your photos should be made by different photographers. This will help diversify the image presentation and get nice visual portfolio dynamics. It’s ok to use your own photos, but they should be taken correctly (camera, settings, sceneries, light). Not everyone can cope with that. One more thing: don’t overuse Photoshop, especially with snapshots and tests. Beauty photos, in their turn, may be (and should be) edited in Photoshop. 7. Protect Your Photo Copyright, Be Serious! Portfolio photos should come with watermarks. This can be, for example, your name and website domain. This will serve an extra promotion tool and copyright protection. 8. Don’t Be Shy to Reveal Your Thoughts and Feelings – Run a Blog at Your Website! Apart from the promo materials, you can additionally reveal your thoughts and ideas in a blog. There should be articles from the professional and personal life, where you will share your impressions from working with this or that stylist, photographer, make up specialist, photo shootings in a certain interesting location etc. – everything, which can help expand your personality in professional and private life. The more humane you look – the better! 9. Don’t Forget to Share Your Professional Information – It Matters a Lot! Anyone, who will view your portfolio, will have a desire to find out your weight, height and other parameters. This information should be precise. Thus, specify the parameters and don’t forget to add information about your tattoos, piercing, skin tone, eye color, size of clothes, shoes, body parameters, habits and other information, which may matter for further cooperation. 10. Strengthen Your Portfolio with Social Network Accounts, Showcase Your Personality to the Public! It’s ok, if you have a separate Instagram account with professional photos and promoted Facebook or Twitter. Make sure to take care of connecting your social network accounts, portfolio likes and reposts. These are powerful traffic, PR and individuality display sources. Even if you have standard personal accounts without tons of photos and millions of remarkable friends, you can use them as well – let everyone see your personality without placing accents on working nuances. Many professionals are interested in the emotional component of a model’s personality not less than in the appeal. What Can You Expect, When Creating a Portfolio in the Website Builder? It’s desirable to use not more than 2-3 fonts – one for the titles, one for the paragraphs and one for special occasions. Common portfolio gallery configurations should also be used for different categories. There is no sense in style mixing. The color scheme should not prevail over the photos as well – the background should be subtle, there should be more space between the photos and larger miniatures. Signatures are not obligatory. Special attention should be given to the home page of a website. You can set a nice video from your successful photo shooting, an image with saturated colors or black-and-white portrait without makeup as a background. Ideas are numerous – take your time to experiment, ask for your friends’ and relatives’ opinion, look for the most effective combinations. Wix allows creating stunning and professional portfolios. You can do that! What you need is high quality photos. The rest implies the investments of a couple of dollars and 1-2 evenings. Get started now!